OK, so I think I’m going to try something fun here. Every day from now until the release of Solo: A Star Wars Story, I’ll post a photo of something from my collection that is Han Solo related. 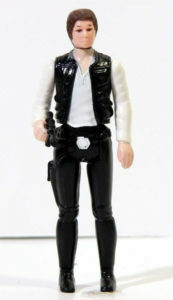 Today’s entry: The toy that started it all for me – the original Han Solo action figure. OK technically, my first figure was Ben (Obi-Wan) Kenobi, and my brother Gary got Han. But after being home for a few minutes, I decided that this guy with the stripes on his pants, cool boots, and cool gun was cooler (we hadn’t seen the movie yet) – so I talked him into trading me. I was right. While Obi-Wan’s a great character (and probably a close second favorite of mine) Han’s by far the cooler of the two. Unfortunately, that was the “large-head” version of the figure, and got broken somewhere along the way. This is the more-rare “small-head” version, which I traded a neighbor kid for when I was about 12.I picked up a replacement weapon for him a few years ago on ebay. Don’t worry, a photo of a “large head” version will be up tomorrow!